When i was younger I grew up on the popular crap like bud, miller, and corona. Don't really party anymore and need that easy water tasting stuff to drink easily on drinking games. I've started drinking red seal. Any suggestions on similar tasting beers? Pilsner Uquarell, Murphy's Irish Stout, Leinenkugel brews, Stella, Spaten/Spaten Oktoberfest, New Glarus brews, Moretti, Newcastle, Boddington, & probably a few others that I can't think of. i bought a six of their sunset wheat yesterday, though, and it's not too shabby. i've been super disappointed by leinenkugel almost all across the board otherwise, though. and they also hold the title in my book for worst beer ever: their raspberry hefeweizen tastes like punishment. Hoegaarden is good for sure. You ever put some citrus in it? I like it w/ food in the summer. That's some tasty refreshment! Ooo, I've missed a good beer discussion. First, on a sidenote, I want to write down some of these suggestions and find a good place to buy a few of them. I love trying a new brew. Now, honestly, I love all beers. IPA, Stout, Bock, Amber, Oh God, I'm drooling. I love microbrews because they have more flavor than the regular stuff (Budweiser, Miller, PBR, etc.). I will still drink the regular stuff, if it's on special or if I'm tailgating. In that case it's usually a PBR. For some good stuff I like me some Bells. Nothing feels more like summer than drinking an Oberon, barbequing and watching the Tigers game. I also enjoy a nice pint of Guinness. It almost feels like I'm drinking milk - I should probably try dunking an oreo in a Guinness sometime, I bet it would be delicious. Don't try to drink this specific Bud Light. Gotta love Cedric the Entertainer. i've never tried the amber, but abita bock is a really amazing beer. actually, everything i've ever had by abita has been pretty impressive. even the purple haze is pretty good, despite the fact that every other raspberry beer i've tried has been barf-tastic. you're lucky to live so close! there are only a few places i know of around here that sell it. I work at a bar (Brannigan Brothers in Lansing) with over 200 micros so I taste a new micro almost every week. We focus on Michigan beers, although we have beers from as far away as Sri Lanka. OK, I grew up in Lansing. I spent 3 years at MSU drinking in EL/Lansing. Where the hell is Brannigan Brothers and why didn't I know about it when I was in school? I've got a sixer of St. Arnolds Brown Ale sitting in the fridge. I need a couple tonight after a long week. Because BB was crap until one of my good friends took over as general manager. He's the one responsible for bringing in all the good beer and liquor and he has only been there for 2 years. The place itself is maybe 7-8 years old. Right on Washington Square downtown. I know where it is now. I left Lansing about 3 years ago, which would explain why I didn't know about it. Usually if we went drinking downtown it would be either The Nuthouse, Rum Rummers or (ugh) 621. I'll have to give it a try next time I'm home. wow! i go to a bar that has beer from all over the world, including a lot of micros. i'll have to ask about some of those. especially the blushing monk! though i gotta tell you, i think i'm gonna stay away far away from any beer intended to taste like raspberry cheesecake. it seems so easy to f up fruit beer and make something that tastes like cough syrup, fruit punch, or (in the case of leinenkugel berry weiss) cheap church wine. not to mention i'm not usually much for lagers or hefeweisens, so i just usually pass anyway in favour of a nice dark stout or porter. My brother just got me drinking Sea Dog Blueberry Ale. MMMMMMMMMMMMMMM!!!!!! For anyone who likes beer, and who also likes the flavor of blueberries, it's a must have. I don't know how widespread it is - it's a microbrew from Maine and I'd never heard of Sea Dog outside of New England. they also have a ton of different wines, meades, and liquors. the staff is (usually) super knowledgable. and it's a hell of a lot cheaper than going to a bar and buying the stuff. I had Brother Thelonius Belgian Style Ale the other day...that stuff is pretty tasty and probably cheaper than buying an imported beer. Not sure about the cost though, since I didn't buy it. I think I've seen that down here, I know all of a sudden a couple blueberry beers staveted showing up at my grocery store. I'll have to give it a try. I've tried the first three. Out of the two pale ales, the Denver Pale Ale is probably the hoppier of the two, closer to an IPA. I hadn't had a Shiner Blonde in quite a while, probably since before I moved to Texas. It's a pretty refreshing beer, good for a hot day. Does anyone know what Babcock is drinking here? Is it beer? If so, what kind? My fave brewery is Great Lakes Brewery. I love their Edmund Fitzgerald Porter. Porters are my favorite beer type. It is also my favorite type to homebrew. The one type of beer I cannot stand are wheat beers. I like the heavier beers of porters and stouts. Man i just bought a six pack of this crazy IPA its called HOPHEAD from tree brewing company its fanfreakintastic i suggest you guys try it, if your into IPAs and HOPS only! You guys are talking about all these crazy beers, so call me boring, but my favorite is good ol' Budweiser. It is the King of Beers. i mostly agree. i love porters and stouts! when i first got into beer, they were all i'd drink! i've had so many bad wheat beers that i'm inclined to say i can't stand them either, but there are a few decent ones out there. arcadia whitsun is pretty tasty. sam adams white ale is too. i can't think of anything else off the top of my head, but i know there are decent ones out there. they're lighter and more summery..if you find a good one, it can be really really refreshing this time of year. q: what do american beer and making love in a canoe have in common? a: they're both ******* close to water! 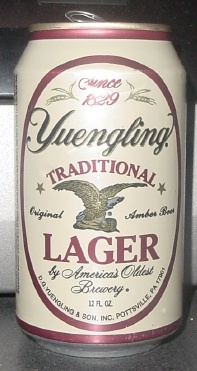 I love Yuengling. Just wish I could get it down here. The woman and I went to Fredricksburg for the weekend, which is a little town west of Austin that's famous for it's German heritage and lots of wineries. For having a bunch of Germans around, the Fredricksburg Brewing Co. wasn't that impressive. The beer wasn't bad, certainly better than drinking Bud, Miller, or Coors, but it wasn't different than any other brew pub I've been to.